Facebook data scientists' Google Trends study finds Princeton is the new Myspace. On Thursday I wrote a story tearing apart a study by a pair of Princeton researchers who predicted that Facebook is headed the way of MySpace. As I explained, the study relied heavily on data from Google Trends, which is a bizarre way to measure user engagement. I pointed out that you could use the same approach to show that the popularity of broadband Internet peaked back in 2005. Now some Facebook data scientists have taken the logic a step further. In a clever Facebook post Thursday evening, Facebook’s Mike Develin, Lada Adamic, and Sean Taylor used Google Trends to analyze the popularity over time of the researchers’ own institution, Princeton University. Sorry, Princeton: It turns out you’re headed the way of MySpace too. Google Trends data for “Princeton,” 2004 to present. This trend suggests that Princeton will have only half its current enrollment by 2018, and by 2021 it will have no students at all, agreeing with the previous graph of scholarly scholarliness. Based on our robust scientific analysis, future generations will only be able to imagine this now-rubble institution that once walked this earth. Laugh at Princeton if you will, but Ivy League universities won’t be the only victims if the researchers’ methodology proves sound. 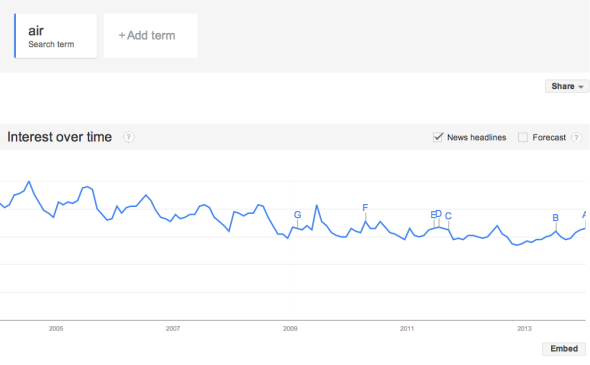 As the Facebook data scientists point out, based on Google Trends data, “air” is also on its way to extinction. 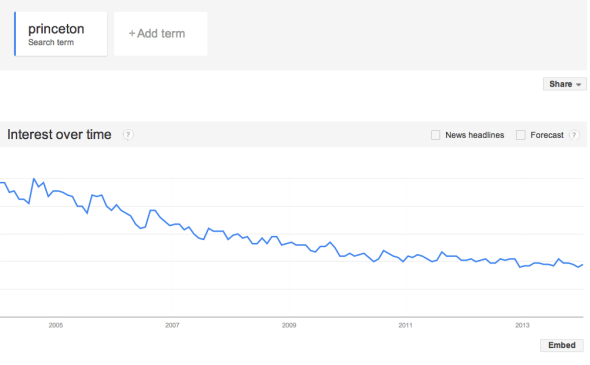 Google Trends data for “air,” 2004 to present.